WooCommerce has become incredibly popular over the years – and for good reason. The venerable plugin turns any WordPress website into an eCommerce powerhouse. It’s extensible and can be used to sell just about any type of physical or digital product. Another facet to love about WooCommerce is the flexibility you have with regards to design. All you need is a compatible WordPress theme. With that, you can create a website that looks and functions every bit as good as some of the biggest names in online shopping. Today, we’ll focus on WooCommerce compatible themes that feature a minimalist style. Their use of whitespace and clean layout will help to draw attention to your products. Plus, they pack features that will provide shoppers with plenty of useful functionality. Sober features 12+ home page designs – including a stunning minimal look that lets shoppers get right down to business. You’ll also find a handy live-search feature, product quick views and mega menus for easier navigation. There are several options for header styles – including a ‘sticky’ header. Copies of Visual Composer and Revolution Slider are included. 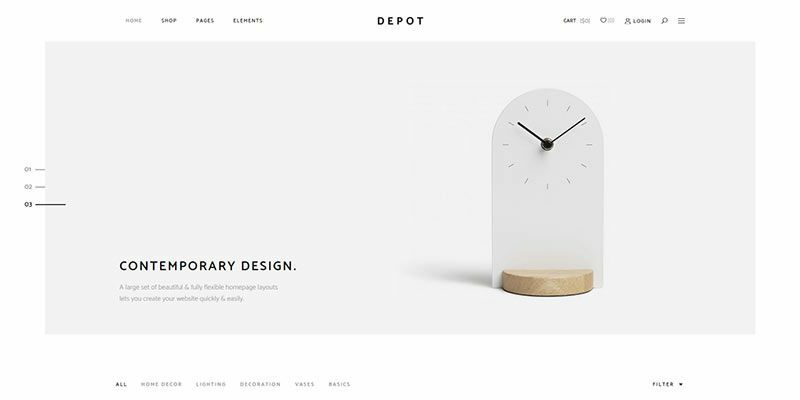 Depot brings a high-end, minimal style to your online shop. There are a dozen home page layouts to choose from – making it easy to find your perfect match. Product listings can be filtered and the ‘Quick Look’ feature encourages customers to explore everything you have to offer. You’ll find several layout possibilities for individual product pages, as well. The included Visual Composer and Revolution Slider sweeten the deal. Unero utilizes AJAX to enhance the user experience with features like a robust product filtering engine. It’s lightning-fast and will help shoppers find exactly what they’re looking for. Other must-haves include the ability to create color, image and label swatches for your products, live search, featured product videos and product quick view. Visual Composer is included, as is the theme’s PSD file. iOne offers a variety of slick home page layouts and some outstanding navigational functionality. Vertical mega menus (via the included Clever Mega Menus plugin) are great for shops with lots of categories. The AJAX powered shopping cart means that customers don’t have to leave the current page when adding an item to their cart. You’ll also get an advanced product filtering engine. Instagram integration allows fan photos to display on your site. Included with the theme is a copy of Visual Composer and a child theme. WizeStore sports an incredibly clean and classy look, along with the ability to customize several aspects of the theme. For example, you can choose from multiple shop and product page layouts and there’s also a way to build your own custom header layouts. Visual Composer allows for building complex page layouts without code and there are plenty of custom Shortcodes available, as well. Revolution Slider is also included. Mnml is (as its name indicates) a cool, minimal WordPress theme. It’s got a dead-simple layout that is also quite effective at showcasing products. Inside, you’ll find three home page layouts, a handsome newsletter signup form and parallax scrolling effects. Product Lookbooks enable you to create beautiful, full-width photo galleries of your goods. Visual Composer is included, as are a selection of custom widgets. Rubino offers a really sharp look and some unique functionality. One standout is their product builder, which lets you easily customize the layout of the product page. Title, images and positioning can all be tweaked to your heart’s content. Elsewhere, the theme features 12 home page layouts, AJAX product filtering and image hotspots – which allow for interactive images via an included plugin. Also, be sure to check out the beautiful mega menus. Visual Composer, Slider Revolution and PSD files are also included. Vinero is billed as a multi-use theme – a WooCommerce shop being one of them. The look is understated, yet makes a great impact. The use of large images ensures that products take center stage. You’ll find multiple page layouts, parallax scrolling, multiple header/footer styles and support for the WordPress Customizer. Included are copies of Visual Composer (and Ultimate VC Addons), Revolution Slider and support for Advance Custom Fields Pro. Franco is an ecommerce theme that includes 16+ home page layouts – each with a unique and compelling look. Also inside are attractive mega menus, multiple shop and product layouts, a product wishlist and AJAX filtering. Store locator functionality is included for those with a brick-and-mortar presence. Multiple custom Shortcodes are built in to make quick work of adding common design elements. Visual Composer (plus Ultimate Addons), Slider Revolution and the ability to access PSD files are included with the theme. Oasis features 9+ home page layouts that skew towards the fashion/home industries. Whichever look you choose, the theme is quite beautiful. Typography is well-done and color design accents help to bring attention to the right places. Useful extras including product photo zoom, mega menus, advanced product filtering and custom swatches complete the high-end shopping experience. Visual Composer and Revolution Slider are included. It really is amazing what you can accomplish with WooCommerce and the right WordPress theme. An online shop with real world convenience and functionality is within the reach of everybody. Not to mention the fantastic look and layout options like those we covered above. Add in simple management on the back end and it’s easy to see why more store owners are turning to WooCommerce.